The CN63500 Series are temperature limit controllers, intended to provide an independent shutdown for thermal processes. The CN63500 accepts signals from a variety of temperature sensors (thermocouple or RTD elements),and its comprehensive programming allows it to meet a wide variety of application requirements. Dual 4-digit displays allow viewing of the process temperature and limit setpoint simultaneously. 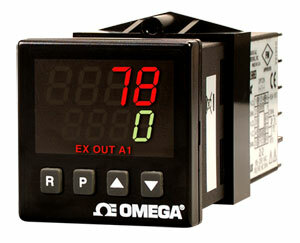 Front panel indicators inform the operator of the process and output status. The main limit output and alarm outputs are field-replaceable. The limit output is selectable for high or low trip activation. If the process temperature goes above the limit setpoint for a high trip, or below the limit setpoint for a low trip, the limit relay will de-energize to initiate a process shutdown. The limit output cannot be reset until the process temperature returns to the proper operating range; manual reset is required (local or remote). Sensor failure will initiate a process shutdown. Relay alarm(s) can be configured to activate according to a variety of actions (absolute high or low, deviation high or low and band in or out) with adjustable hysteresis. A standby feature suppresses the alarm during power-up unit the process stabilizes outside the alarm region. The unit is constructed of lightweight, high-impact plastic case with a tinted front panel. the front panel meets NEMA 4X (IP65) specifications when properly installed. Multiple units can be stacked horizontally or vertically. Modern surface-mount technology, extensive testing, plush high-immunity to noise interference makes the CN63500 extremely reliable in industrial environments.